Happy Blizzard of 2016, everyone. While you might not be excited about the snowstorm currently rocking the Northeast region, Tian Tian the panda sure is. He woke up this morning at the Smithsonian Zoo in Washington D.C. to find just about two feet of snow at his paws. And he was as happy as a panda in a snowstorm, which is a new way to describe sheer excitement. The nine-year-old panda appears to love the snow. Like, can we just talk about how this panda currently has no chill when it comes to the snow? He slides around in it, he rolls around in it, he even makes something akin to a giant panda snow angel, waving his arms around in the powder, not caring about the fact that it’s all up in his fur. When was the last time you let loose in a snowbank like Tian Tian? Someone get him a sled, because that’s the last thing he needs to truly make this a perfect snow day. The Smithsonian Zoo is currently closed right now, because not all the animals love the snow as much as Tian Tian. It’s scheduled to open back up next week, if you’re willing to brave the snow to go check in on Tian Tian’s snowy adventures. 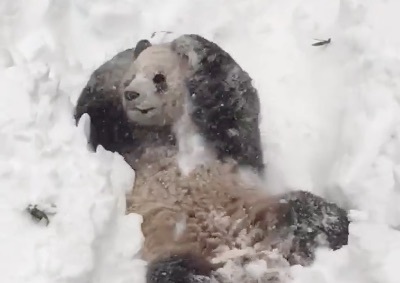 But for now, we’ll welcome any more happy snow-panda videos the Smithsonian wants to send our way, because everything about this video warms our frozen blizzard heart.